Sound "What was impressive immediately...was the E48s ability to disappear in the room"; "a little forward-sounding, but "quick as demons" and possessing an "incredibly clear midrange"; bass could sound strained at moderately loud listening levels. Features "Very slim towers" featuring a pair of 4 1/2" midrange drivers, a 1" silk-dome tweeter and an 8" side-mounted woofer. Use Tim preferred the speakers configured with the woofers to the outside, but experimentation is warranted. the E48s provide more performance and refinement than they have a right to." 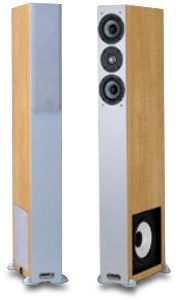 When I first learned that Id be reviewing a pair of American Acoustic Design E48 speakers, I was intrigued because they share a common lineage with my own Soliloquy 5.3s in that both speakers were designed by the prolific Phil Jones. You may have heard or read about some of Jones designs. In addition to Soliloquy, he has been involved with several companies, including Acoustic Energy, Boston Acoustics, Wharfedale, and Platinum Audio. Although AAD is a separate company with Jones at the helm, there is a business link with Soliloquy, the sole importer and distributor for AAD in North and South America. My first exposure to AAD was actually while I was on a group tour of the Soliloquy factory a couple years ago down in Raleigh, North Carolina. It was there I met Phil Jones along with the rest of the very friendly Soliloquy crew (love that Southern hospitality), and he gave us a preliminary introduction to his new AAD product line. Jones showed us a fairly broad array of products ranging from very large home-theater speaker systems to tiny little boxes clearly geared to take on similar products from the likes of Energy, Gallo, and Bose. Along with how good they sounded, the most staggering thing about these products was their unbelievably low price. Turns out Phil Jones emigrated to mainland China to start up his own factory. This kept manufacturing costs low and allowed him to be directly involved in all phases of R&D, design, parts sourcing, assembly, quality control, and shipping. This is an optimal arrangement from a business perspective -- if you can make it work. And it looks like Phil Jones has been able to do just that. The $690 USD E48s are very slim towers measuring 42 1/4" high, a scant 5" wide, and 12" deep, while sporting an oh-so-trendy silver-ish faceplate that spans the full frontal length of the speaker. The feet of the speakers protrude out from the four corners of the base and also wear the required silver cladding. But theyre made of -- gulp -- plastic, and one of the feet partially broke off of the review pair during shipping. Dave Berman, president of Soliloquy, assured me they are on top of this and have modified the base materials and packaging to avoid this happening with future shipments. The rest of the speaker was finished in a maple vinyl (the only finish available at this time) that, while it wont fool the woodworkers amongst you, certainly looked good enough to pass muster at Sheas Lounge. My initial thoughts on the aesthetics are that if youre looking for this type of product, the E48s do look pretty cool and are about as unobtrusive as you can get for good-sized floorstanding speakers. An encouraging sign in unpacking the speakers was that they weighed quite a bit for such svelte floorstanders. In fact, each tower weighs a surprisingly hefty 44 pounds, and as it turns out theres a side-mounted 8" woofer on each of the towers that no doubt adds some poundage. Dave Berman explained that the bottom section of each speaker is reinforced with cast-iron ballast to further damp the 3/4" MDF cabinet structure and tighten up the sound -- hence the mass. This also puts more weight at the bottom of the speakers, which, along with the aforementioned protruding feet, serves to make the ultra-slim E48s more physically stable and resistant to tipping over -- a nice touch. The other three drivers are mounted at the top front of the speaker in a midrange-tweeter-midrange array that includes two interesting and identical 4 1/2" aluminum-loaded polypropylene midrange drivers and a 1" silk-dome tweeter. I dont know if it was a result of the proprietary cone material or not, but the midrange drivers are just about the same color as the speakers silver faceplate, which has the effect of making the already half-starved towers even less visible than if the drivers were ubiquitous black. Looking even closer, and much to my surprise, I noticed the surrounds of the midrange drivers seemed to be of the same dense rubber material and design as my Soliloquy 5.3s -- no wimpy foam here. Said drivers are tied together with what AAD calls "minimal phase" crossovers that are designed to improve soundstage depth and width. The woofer uses a second-order crossover to the midrange drivers at 120Hz and the mids cross to the tweeter at 3kHz, also using a 12dB-per-octave slope. Frequency response is stated as 30Hz to 20kHz +/-3dB, and nominal impedance is 8 ohms, with the 4.5-ohm minimum occurring at 550Hz. Rounding out the specs, sensitivity is quoted as 89dB/W/m, and the E48s are rated for use with amplifiers putting out anywhere from 25 to 200 watts. Although I would not make tubes my first choice for powering the E48s, they certainly are not what I would call high maintenance from an amplification standpoint and should work well with a wide variety of amplifiers. It came time to hook up the cables, and I found two sets of plastic locking nuts set very close together and recessed in a staggered fashion into a small plastic box near the bottom rear of the speaker and just above the 3" rear port. The combination of all these design elements came together to make it very difficult to clamp down on (or loosen) the locking nuts to get a tight connection. In addition, the five-way binding posts are surprisingly wide, making it even more difficult to make a connection despite the relatively generous spades on my Acoustic Zen cables -- spade users beware. Also, not overly impressive was the knuckle-rap test that revealed enough hollow resonance to launch cabinet-coloration red flags, but to reach the price of $690 per pair, corners have to be cut somewhere, and the proof, as always, will be in the listening. One thing that made the E48s easy to like was their flexibility in placement options. A tangible benefit of side-firing woofers is that you can configure the speakers with the woofers on the inside or outside, depending on which works best in your particular room. In my situation, I found the woofers on the inside to be boomy and out of balance with the rest of the frequency spectrum. Once on the outside, the woofers snapped right into line with the other drivers, and I started fussing with final in-room placement. I generally prefer nearfield listening, and my Soliloquy 5.3s reside about one-third of the way into my room, where things really open up and the room boundaries melt away. I started there with the E48s just for reference, and it was clear from the get-go that they were in need of some room reinforcement, as the midrange sounded far too thin out there for my liking. So back they went toward the wall, and they finally ended up with the speaker fronts about three and a half feet from the front wall, four feet from the side walls, and seven feet apart with toe-in pointing the speakers just past my shoulders. No matter where I placed the E48s, I had no problem locking in a solid and stable center image. My initial impression before final setup and break-in was that the E48s were a little forward-sounding with an exceptionally clear midrange and somewhat lumpy bass. As Phil Jones designs tend to change dramatically over a relatively long break-in period, I gave the E48s a few solid weeks to loosen up, after which the sound evened out. But the character I heard out of the box remained basically intact. What was impressive immediately, however, was the E48s ability to disappear in the room. I tend to expect this from well-designed slim tower speakers. A logical place to start with the E48s was Patricia Barbers Companion [Blue Note/Premonition 7243 5 22963 2 3] live CD, as it poses challenges in many areas. Specifically, I was looking to the introductory stand-up bass solo in "Use Me," a torture test even for large-dollar full-range speakers, to see how these side-firing, paper-based woofers would hold up under extreme conditions. There was never a doubt that the 8" drivers were quick enough to keep up with the majority of the performance, but at moderately loud volumes, there was evidence that the woofers were straining on the lower notes. This was evidenced by a kind of bloated, swallowing sensation that became a little disjointed within the flow of the bass line. I also felt the bass lost some of its woody tonality, and its placement in the stage was slightly blurred versus that of my reference speakers. This could have been a function of the side mounting of the woofers, a cabinet resonance, the positioning of the speakers, interactions with my room, or some combination of all four. Lets keep this in perspective though. Although not perfect, the E48s did an admirable job of portraying this particularly difficult instrumental obstacle course, and overall there was deeper, tighter, and more tuneful bass emanating from these skinny towers than I would have thought possible at first glance. I frankly have my doubts, however, about these speakers reaching the stated 30Hz rating. But they do merit my 90/90 rating, which states that 90% of the people who listen to these speakers will be able to listen to 90% of their music without feeling the need for a subwoofer. I cant say that about too many speakers under $1000 per pair. Along with the bass torture test above, Companion offers up a host of other challenges, not the least of which are Ms. Barbers vocals themselves. I find that deeper female vocals can be difficult for many speakers to get right in that some leave behind a certain amount of the natural heft inherent to the singers seductive sound, while others capture the seductive aspect at the expense of clarity. The E48s are more representative of the former but still convey a respectable amount of heft that did not leave Barber sounding thin or wimpy. This points to what I feel is one of the absolute strengths of these speakers, which is their incredibly clear midrange. Those two little 4.5" drivers really have the clarity department nailed, and equally impressive is that even at louder volumes I could not make them break up or misbehave in any way. These speakers are also quick as demons, so much so that they seem almost hard-wired to the source. Not to harp on Companion, but it is also an excellent conduit to test the imaging and soundstaging properties of a speaker as it is loaded with various percussion instruments that often come from different places within and throughout the soundstage. As mentioned earlier, imaging is a general strength of the E48s as every element of a performance is easy to locate, and you dont need to get out the measuring tape or level to make this happen. And while everything within the soundstage is secure, I did not find the soundstage itself to be overly deep. For instance, and again on "Use Me," there is a guitar that phases in from the left rear of the stage just after the bass solo. The E48s tend to pull it up closer to Barber and give me the sense that it is a little more prominent than it should be within the context of the performance. I think this is at least partially a consequence of the E48s tweeter being relatively energetic, which tends to make the overall presentation more vivid but also pulls certain elements somewhat more forward. Although the E48s are very detailed, I would not categorize them as overly bright or harsh. Clear evidence of this came by way of cymbals and sibilants, which although pronounced, never became smeared or sizzly. I much prefer what these soft-domes do to just about all the metal-dome tweeters Ive heard in this price category. Another disc I enjoy for its balance of natural ease and detail is Oscar Peterson meets Roy Hargrove and Ralph Moore [Telarc CD-83399]. In fact, until I read the liner notes, I thought this was a live recording due to the spatial feel and natural interplay among the performers. One of the highlights of the recording is the way the cymbals are captured with complete tonality intact and in such a way that they almost seem to physically exist and float in the air in their proper place in the soundstage. Through the E48s, I heard a lot of the drumstick and the upper metallic frequencies of the cymbal on "Tin Tin Deo," but the lower tonal properties that allow you to tell this is a heavy ride cymbal were lacking or overshadowed. Down the frequency spectrum a bit, the trumpet came through clear as a bell (pun intended) with notable transient snap that really made me feel as if I wasnt missing anything whatsoever. However, the sax solo that immediately follows sounded a little thin and the instrument lacked some of its warm, reedy character, especially in the lower registers. Likewise, the piano seemed to be represented mainly through its hammer and wire components and lacked the fullness of sound and scope generated by its soundboard and other resonant characteristics. Instead of filling in a real piano-sized space around and behind the left speaker, a smaller rendition of the piano resided behind and just inside the speaker. I have heard several other speaker systems that fall in the E48s price range (mainly sub/sat combos), and rather than disparaging the usual suspects directly, suffice it to say the E48s are at an entirely higher level of performance. But again, given their related lineage, I thought it would be interesting to compare them to my Soliloquy 5.3s to explore where the differences lie between a pricier audiophile design versus an overachieving budget-priced product. The fact that I would even consider comparing the E48s to the thrice-as-expensive 5.3s should tell you that, despite some of my aforementioned reservations, I have respect for what the speakers accomplish. One thing that is clear is that both speakers are masters at pulling off the disappearing act while putting the music in the room with no equipment-related distractions. Where the 5.3s excelled was with respect to the depth of the soundstage and, even more importantly, integrating individual aspects of that stage into a cohesive, three-dimensional sonic picture. One of the main factors here is the AADs tweeter, which although clean and detailed is a little feistier than the Soliloquys more laid-back and refined-sounding silk dome unit. In the mids and upper mids, I actually thought the E48s were clearer and more transparent, which also made them sound snappier and quicker overall. It's in the lower mids, or what I like to call the "meat and potatoes" part of the midrange, where the 5.3s showed the benefits of their larger 5 1/4" midrange drivers. The bigger Soliloquy towers flat out did a better job of fleshing out the body and soul of the music in this critical area, making the E48s sound relatively thin. The 5.3s bass was more tuneful, better focused, and weightier than that of the AADs, but the E48s aluminum woofer was quicker and allowed for much easier room placement by virtue of being side mounted. So all in all, the E48s put on an impressive showing, and it would not surprise me if these stylish speakers would compete very well against other floorstanders in the $1000 price range. Taken in the strict context of an audiophile product, the AAD E48s do a very respectable job with some limitations in terms of overall soundstage presentation and frequency balance. But those who prefer a more detailed and forward presentation may not view these as limitations at all. Considering their price along with all the things they get right (and, just as importantly, all the things they dont do wrong), the E48s provide more performance and refinement than they have a right to. This puts them head and shoulders above other products I have heard in this price segment. If you're looking for a cost-effective, modern-looking, and unobtrusive nearly full-range floorstanding speaker, your choices are limited. But AAD E48 is out there and certainly worthy of a long listen. Our thanks to SoundStage! and Tim Shea for a fair review of our AAD E-48 towers. Manufacturers are always nervous when asked to submit a very affordable product. Reviewer standards tend to continuously expand. They are exposed to more and more expensive design efforts that attempt to redefine what's possible when money isn't an issue. Manufacturers then worry. Will the reviewer maintain perspective with one's entry-level product? Does he even know the "state of the art" at this end of the range? Does he have a realistic appreciation for what is and is not possible? We needn't have worried. Despite Tim's critical comments when comparing our $700 AAD E-48s to his $2,000+ Soliloquy Model 5.3 reference speakers, the review's conclusion places these findings into proper perspective. The E48s "provide more performance and refinement than they have a right to..., [putting] them head and shoulders above other products" he has heard in this price segment. And that is exactly why Phil Jones committed to the unusual strategy of relocating to Shunde, China rather than dealing remotely with off-shore vendors. By living on the actual premises, his AAD factory combines European and US standards of fit'n'finish and performance with the price advantages of current Asian manufacturing. We are confident that music lovers shopping with a tight budget but hopes of high performance will find much to admire in Phil's E-Series AAD speakers. Those curious about what he can accomplish when not restrained by real-world budgetary considerations should take a look at his 2000 Series products.